Acoustical oceanography describes the role of the ocean as an acoustic medium. It relates oceanic properties to the behavior of underwater acoustic propagation, noise and reverberation. Acoustical oceanography crosses four other branches of oceanography: physical, chemical, geological and biological oceanography. The single most important acoustical variable in the ocean is sound speed. The distribution of sound speed in the ocean influences all other acoustic phenomena. The sound speed field, in turn, is determined by the density (or temperature and salinity) distribution in the ocean. Advection of the underwater sound field by water currents is also important. Refraction of sound by fronts, eddies and other dynamic features can distort the propagation of acoustic signals. 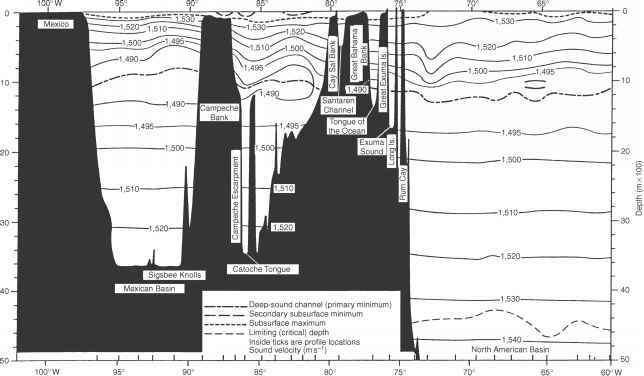 Knowledge of the state of the sea surface as well as the composition and topography of the sea floor is important for specification of boundary conditions. Bathymetric features can block the propagation of sound. Biological organisms contribute to the noise field and also scatter underwater sound signals. The balance of this chapter will address physical and chemical properties, sound speed, boundaries, dynamic features and biologics. A number of books and published papers already exist on these subjects and appropriate citations will be made to them. Notable text and reference books of a general nature include those by Sverdrup et al. (1942), Neumann and Pierson (1966), Gill (1982), Apel (1987), Pickard and Emery (1990), Peixoto and Oort (1992) and Medwin and Clay (1998).